According to the press release for this Blu-ray, 1944’s Phantom Lady offers “the consummate crime classic”. That seems like a high bar, one I wanted to see if the film could leap. After Scott Henderson (Alan Curtis) argues with his wife, he goes to a local bar. While there, he meets a mysterious, melancholy woman (Fay Helm) who will spend time with him as long as she doesn’t need to provide her name – or get his. After this “date”, Scott goes home to discover that someone murdered his wife and the authorities view him as the prime suspect. Scott mentions his alibi but can’t find the mystery woman to support him. In addition, no one seems to recall having seen the pair together. With Scott at risk of imprisonment, it falls to his dedicated secretary Carol "Kansas" Richman (Ella Raines) to prove his innocence. That’s a downright Hitchcockian notion, what with an unjustly accused man and the pursuit of the truth. Lady differs from Hitch’s work in its focus, though, as Scott plays a surprisingly small role in the story. Not that Scott lacks any part, of course, but after the first act, he largely disappears from the film. After that, we concentrate on Kansas’s work as well as the efforts of sympathetic Inspector Burgess (Thomas Gomez). While I like the Burgess character, he does cause distractions. Most of the tale deals with Kansas and her actions, so the scenes without her can feel oddly tangential. That’s no criticism of the Burgess character or Gomez’s performance. Indeed, the astute inspector comes across like a pretty fascinating personality, and Gomez plays him in a deft manner. However, Lady really stands as Kansas’s story, so when we leave her, the narrative sputters somewhat. As much as I like the solo moments with Burgess, the movie works better when it sticks with its lead. Kansas becomes a much stronger character than anticipated. I assumed she’d be a lovesick nothing, but Raines gives her real heft and determination. Raines carries Lady through a number of potentially spotty moments. Take the scene in which Kansas goes undercover to seduce and get info from horny drummer Cliff (Elisha Cook Jr.). Raines overcomes the absurdity of the situation and makes the sequence work with charisma and willpower. Unfortunately, Raines can’t negate Cook’s hilariously awful fake drumming. We’ve seen worse instrumental miming over the years – maybe. I can’t think of crummier faux playing right now. Despite that problem and some tonal inconsistencies, Lady mostly offers a fun, lively affair. While it can be an odd conglomeration of elements, it winds up as an enjoyable noir effort. Phantom Lady appears in an aspect ratio of approximately 1.37:1 on this Blu-ray Disc. Though not a poor image, the transfer came with issues. Sharpness mainly came across well, with images that largely appeared accurate and well-defined. A few slightly ill-defined elements materialized, but most of the movie showed nice accuracy. Lady lacks moiré effects or jagged edges, and edge haloes also remained absent. The presence of light grain implied that the image didn’t suffer from notable digital noise reduction. Blacks looked taut and dense, while low-light shots demonstrated appropriate smoothness and clarity. Contrast also appeared well-developed, as the black and white photography showed the expected silvery sheen. Lady lost nearly all its points from the condition of the print. During the credits, gate hairs appeared, and after that, we got quite a few lines, specks and nicks. The rest of the image worked fine, but the presence of so many source defects dropped my rating to a “C-”. A cleaned-up Lady would’ve earned high marks, but this one simply came with too many issues. I thought the movie’s DTS-HD MA monaural soundtrack seemed dated but more than adequate. In terms of dialogue, the lines remained intelligible and offered reasonable clarity. Neither music nor effects boasted much range or dimensionality, but both appeared clean and accurate enough, without distortion or problems. The track lacked hiss or background noise. This mix felt fine for its vintage. As we meet the extras, we start with Dark and Deadly, a 52-minute, 18-second documentary. Created in the 1990s, it includes comments from directors Robert Wise, Edward Dmytryk, James Foley, John Dahl, Carl Franklin, Bryan Singer and Dennis Hopper, critics Alain Silver and B. Ruby Rich and director of photography John Alton. “Dark” looks at the history and definition of “film noir” as well as various examples of the genre. Parts of “Dark” work fine, but the show offers much too heavy an emphasis on then-current 1990s “neo-noirs”. That might’ve allowed viewers to connect to the genre 20-plus years ago, but now it seems like a misstep, as many of these movies are now essentially forgotten. “Dark” becomes a spotty overview. From 1944, we find a Lux Radio Theatre broadcast of Lady. It runs 59 minutes, 33 seconds and allows Ella Raines and Alan Curtis to reprise their roles. As expected, the radio version abbreviates the film’s story, though it actually adds a little exposition at the start. The show becomes a fun addition to the package. Finally, we locate an Image Gallery. It includes 29 stills that mix publicity shots, ads and other art. It’s a short but effective collection. 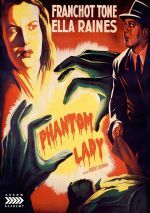 As an early noir effort, Phantom Lady can seem spotty. However, the movie delivers good entertainment, largely thanks to a stellar star turn from Ella Raines. 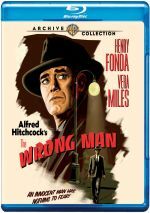 The Blu-ray brings problematic visuals as well as decent audio and a few useful bonus features. Lady doesn’t fire on all cylinders but it does more right than wrong.